Get caught in a compromising position… again, with him. HOW TO MARRY A ROYAL HIGHLANDER is an absolutely delightful read, one that had me in stitches from the beginning to the end! 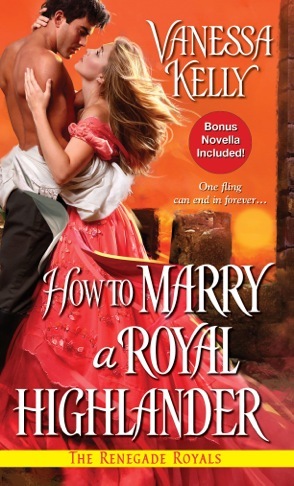 With a spirited and lovable heroine, a confident and attractive hero, engaging dialogue and lots of fun secondary characters, HOW TO MARRY A ROYAL HIGHLANDER belongs on everyone’s summer reading list! Eden Whitney’s quest for experimentation has landed her in a very hot spot with the ton and the only way to salvage her tattered reputation is to have her leave London for the country for some time. While going away to Yorkshire is the worst thing that could happen, option B is not any better, especially as she would have to go to the Scottish Highlands with the one man she detests – Captain Alasdair Gilbride. Alasdair Gilbride fled his family estate to avoid an arranged marriage a decade ago but he is now required to return and take his rightful place as the heir to the earldom and its attendant duties which include honoring the arranged marriage he ran away from. However, he is not going down without a fight and Eden Whitney might just be the key to his victory if he can successfully maneuver her into helping him. What results is a comedic blend of romance and mystery. Eden puts the ‘S’ in sassy and her vivacious and high-spirited behavior hides an adventurous and curious person. Her dislike for Alec is actually a cover for her feelings for him, which are definitely far from dislike. Alec was attracted to Eden from the first time he met her but the circumstances of their meeting were less that ideal and set the tone for a contentious relationship. The time spent on the trip to his family seat gives them a chance to get to know each other better and even family drama and attempted murders can’t put a damper on their feelings for each other. The fun part of reading this book was the dialogue and it kept me turning the pages quickly. Ms. Kelly’s characters are full of life and opinionated and I love it! I will definitely be reading the previous books in the series.